Maritime High-Quality Safety Training - De website van salvettifoundation! MTC International globally supports safety training centers and their clients, mainly active in offshore, shipping and renewable energy. Centers profit from benefits like network certification, shared services for course administration and booking systems, joined sales and presence at important tradeshows and events in the industry. The state-of-the-art facility in Amsterdam and MTC International's innovative approach promise to offer more-efficient, high-quality safety training by harnessing the latest technologies and providing a clientdriven and flexible service. MTC Amsterdam makes intelligent use of an old shipyard in the heart of the city. The building has been fitted with three floors to enable small groups to undertake seperate activities at the same time. 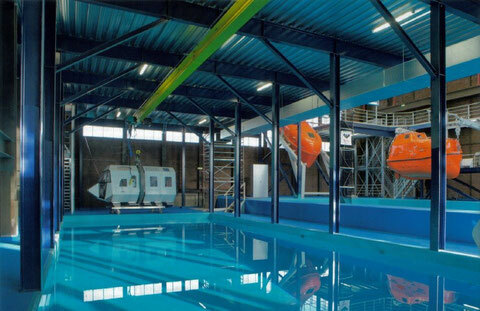 It also boasts a 16 meter indoor wind turbine, a sea survival and lifeboat training pool and a virtual-reality room for team training.